I've talked about my love of pickled foods more than a few times, but I haven't really had a chance to go crazy with the pickle-making until a couple of weeks ago. Pickling veggies for me is almost the culinary equivalent of making art from garbage. I was on a mad fridge cleaning mission and was getting a bit frustrated with all the dairy and other food going into the trash (note to self, cottage cheese is only a good idea if you KNOW you're going to eat it right away). When I got to the crisper drawer, I was faced with shrivelling cucumbers, wrinkling peppers, limpening carrots and (very slowly) imploding golden beets. It was too late for the liquified celery, but I was determined to salvage as much of this vegetable matter as possible. Best way to give new life to old veg? Pickle those suckers! Now, traditional store-until-zombie-apocalypse pickling is basically the same process as "fridge pickling" with an extra step: You bathe the full Mason jars in boiling water to create a seal and disinfect the jars. Now, that doesn't work for me for two reasons: first, I don't have that many Mason jars, and second, I'm terrified that the boiling water will somehow cause the jars to shatter (I admit it, I have a bit of a neurosis about broken glass ever since I was a kid and had a tiny shard of glass stuck in my foot for months and finally had to dig it out with a pair of scissors. Eep). So, until I get over my glass neuroses, it's a fridge-pickler's life for me, yo-ho! But for the sake of putting out a recipe that makes some sort of sense, I'll stick with only two kinds of vinegar in these recipes, but trust me, they'll still turn out great! Also, since the most common form of pickled veg are cucumbers, I'm calling those 'pickles', because we all do. Makes one small jar's worth. - 2-3 golden beets (instructions for beets to follow) - you can use 'regular' beets, but everything will be tinted by the beets - I find the colour profile of golden beets with carrots very bright and cheering. - 1/2 tsp pickling spice (the spice mix I had included allspice - probably too much of it, coriander seeds, cinnamon pieces, cloves, mustard seeds, and peppercorns) - you might want to pick through the spice to make sure you aren't using too much of one element over the other. NOTE: As with most spice blends and trying new things out, sometimes it's best to try your own ideas out and see how they go. I'd love to do some pickling using various dried chilis like guajillo, pasilla and mulatto. ﻿ - First, you want to roast your beets for about 10-15 minutes at 350 degrees farenheit. Once cooked, set the, aside to cool. Once cool enough, peel the skins off beets. You may get orange fingers as a result. Live with it. - Next, slice your beets. A lot of recipes call for whole beets, but this is small batch pickling and slices are better for this recipe. - Place carrots, beets, onion and thyme in a glass jar with a tight-fitting lid. - In a saucepan, combine remaining ingredients to make pickling liquid and bring to a boil. - Remove from heat and carefully pour pickling liquid over veggies in the jar. If there's too much liquid and not all the spices are coming out, spoon them out and add to the jar. - Let cool without a lid until lukewarm. Close lid and refrigerate for an hour or so before serving. The rest of the Ingredients and the Directions are exactly the same as with the Beets and Carrots. I made a different pickling liquid for the cucumbers than the first two, mostly because dill pickles aren't supposed to be sweet! It's the process is the same as the other pickles, but I have a couple of notes. First, you might noticed that garlic shows up twice as an ingredient. That's because you want the garlic slices in the jar with the cukes and dill before adding the pickling liquid, but you also want to flavour the liquid with more garlic, hence the crushed garlic clove. Because more garlic! Secondly, you might be wondering what's up with the tarragon (vinegar and herb). Well, all I can say is try it. I think it adds beautiful flavour to the pickles. Otherwise, it the same process of: slice veg, put in jar, boil pickling liquid, pour into jar, let jar cool, refrigerate to give veggies crunch and that's that! 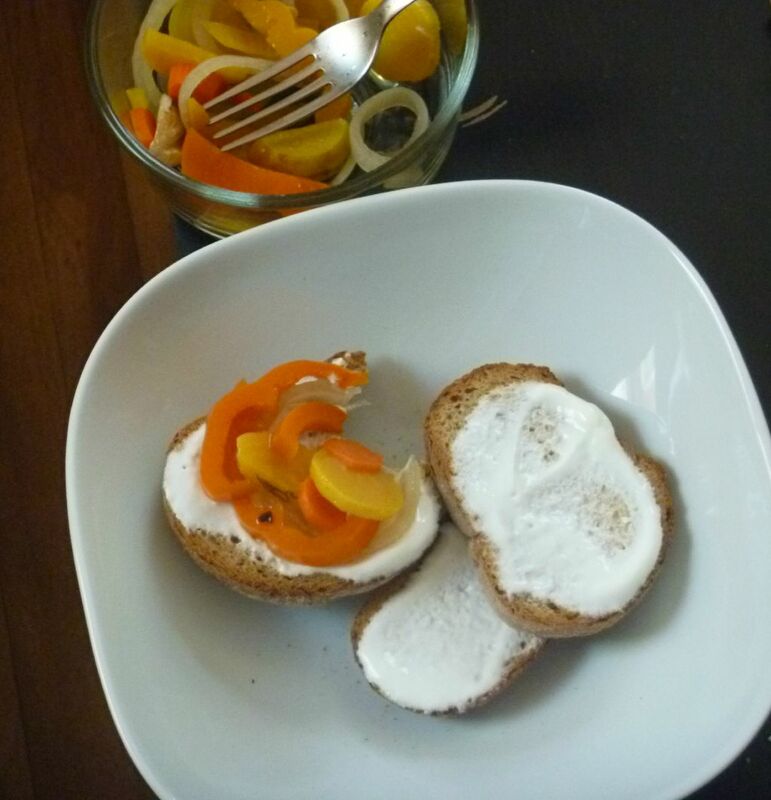 As an added bonus snack on ridiculously hot days, you should toast some rye bread, spread some plain yogurt on top, and put some of the Beet-Carrot Pickles and/or Pickled Peppers on top of that and enjoy! ﻿ And there you go! Get out there and turn your old veggies into deliciousness!